Ful Mudammas, the national dish of Egypt, is also known as ‘the rich man’s breakfast,’ ‘the shopkeeper’s lunch,’ or ‘the poor man’s dinner,’ according to the Cookbook of the Year, "A Mediterranean Feast" by Clifford Wright. There are different kinds of fava beans, each requiring a different cooking time. 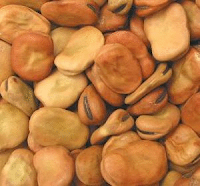 Wright says the proper fava bean used for making ‘ful’ is the smaller rounder one the Egyptians call ‘ful hammam,’ or bath fava. The only time I’d ever eaten ‘fool’ was at the invitation of long-time friend Arlys Koushakjian. She, her parents and her husband’s family had all lived in Egypt, at least for a while. It was a staple in their homes. Wishing to prepare a special meal for Doug and me, Arlys and Hagop invited us to their home for a Sunday brunch - featuring Fool. It wasn’t just a recipe; it was a ritual. Arlys, being a modern, working woman, makes Fool using canned fava beans. She uses one can of beans (undrained) for every two people being served, sprinkles in onion and garlic powder, (or finely chopped sweet onion instead of onion powder), olive oil, and lemon or lime juice. All of her amounts are "to taste." Cook until all beans are soft, then, mash. Mash a little, or mash a lot - that’s up to you, too. A variety of toppings should be made available for garnishing: chopped parsley, scallions, sweet onions, tomatoes, sliced hard-cooked eggs, and extra olive oil. Guests can add the toppings of their choice. Another suggestion from Arlys - once the fool is prepared, make an "X" shape on the surface, and drizzle some olive oil in its indentation. Here’s a recipe for Fool Midammis (their spelling variation, not ours!) from the cookbook "Middle Eastern Cooking," a Time-Life publication, that you might like to try. 1. Wash the beans and lentils in a sieve or colander set under cold running water until the water runs clear. Then drain thoroughly. 2. In a heavy 3 to 4 quart saucepan, bring 1 quart of water to a boil. Add the beans and lentils, reduce heat to low and partially cover the pan. Simmer for 3 to 4 hours or until the beans are tender and show no resistance when pressed gently between your fingers. Check from time to time to make sure that the beans are mosit. If they seem dry, add a few more tablespoons of boiling water. When they are done, there should be almost no liquid left in the pan. Transfer the entire contents of the pan to a bowl and cool to room temperature. 3. In a deep bowl, beat the oil, lemon juice and salt together, using a whisk or a fork. 4. Add the beans and lentils. Mash them gently with a fork, and stir until they absorb most of the dressing. 5. To serve, spread the bean mixture on a platter or individual plates; sprinkle with chopped parsley, and garnish with olives. This is no April ful's joke: Some people have a rare but serious allergy to fava beans known as favism. It's the result of a genetic disorder that affects mostly males of Middle Eastern, African and Mediterranean ancestry. Reactions appear to occur most often after eating raw beans or inhaling the plant's pollen, but anyone with the predisposition should stay away from fava beans entirely. Check this link to the National Library of Medicine for more info. * Bunch of fresh fava beans, taken out of the pods. Brown the meat in olive oil, black pepper, and allspice over medium heat. Add the onions and saute until limp but not brown. Add the fava beans and lightly saute. Add all the remaining ingredients except for the dill. Salt to taste. Simmer on low heat until the beans are soft and the meat is cooked (30-45 minutes). Five minutes before the end, add the dill and correct the seasonings. Remove from heat and serve with rice or bulghur pilaf. Note: The same recipe can be used for fresh chick peas (which don't taste anything like canned or dried chick peas). With some variations, it can also be used with almost any vegetable. Sounds delicious, Ara! Fresh fava beans in your local grocery store? I can't even find the canned or frozen variety unless I drive to the nearest Middle Eastern store which isn't around the corner. So much for south Florida shopping! Wait till you try fresh chick peas (garbanzo beans)! :-) Come on out to LA, Robyn, and I will cook you a special meal with all the ingredients that are hard to find in your corner of the woods! Thanks, Ara! I may take you up on that invitation some day. The key to a mouthwatering, delicious ful is lots of fresh mashed garlic, lots of fresh lemon juice and salt. That is the Lebanese way of making ful, which, in my biased opinion, is far tastier than the Egyptian version, which omits the garlic and lacks flavor. you have to add garlic lots of it and lemon juice thats how my grandma used to make it. The best fool mdamas is the Lebanese version, one can of precooked fava beans in its juice,1 clove of garlik, fresh lemon juice,salt/ cumin/ red Aleppo pepper all to taste.. simmer it once juices are evaporated smash them a little. Thanks, Ara, Noura, Hyechica, and (another?) Ara! I have one can of fava beans remaining in the pantry, so I'll prepare it following your similar recommendations. Given the large Mediterranean, Middle Eastern and Indian populations in Houston, I can often find fresh fava beans and they cook up totally differently than the dried version. They come in what look like over-sized pea pods and each pod contains 1-4 actual beans. Remove them from the pods and boil in salted water for 4-5 minutes. You then need to remove the thin outer skin with a sharp knife. The resulting naked beans are delicious, served warm with some drizzled olive oil and sprinkled Parmesan cheese. My local Armenian grocery store, Phoenicia, carries frozen favas from Egypt, already "double" shelled. Just boil in water and they are ready to eat.